This construction allows the holster to work without loops, clips or other gadgets to keep it in place. Combined with the “sticky” exterior, pressure from your waistband holds the holster and your firearm in place. The absence of clips or loops also makes the holster ambidextrous and provides tremendous flexibility in how you carry, allowing the user to place the holster at a variety of angles and positions around the waistband. When drawing the pistol, the sticky exterior keeps the holster securely in place while the textile interior allows the firearm to come out cleanly. The company is also working on accessories that will allow users to wear their “sticky” holsters around the ankle or thigh, providing even more carry options. Sticky holsters are currently offered in 17 relatively generic sizes which will accommodate nearly all makes and models of handguns. 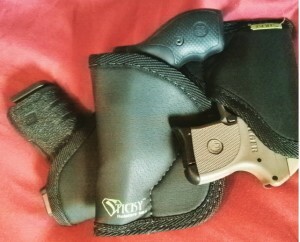 Body heat during normal use allows the holsters to conform to the firearm for a more custom fit. After a few hours of wear my holster had already conformed to the first test pistol I used it with and I could see the rough outline of rails, slide releases and other features. After a day or so of wearing it with a second test pistol, those outlines were almost completely gone, replaced by feature outlines of the new firearm. I did notice that after about a week of wearing the holster every waking hour, some very minor abrasions at wear points – places corresponding with protrusions on the firearm such as rail corners, take-down pins, etc. The abrasions are hardly noticeable and do not appear to affect performance at all. The company rep, who still regularly uses his original J-Frame holster after years of use and wear, notes that the material is tested to 12,000 rubs and if a holster prematurely looses it’s sticking ability it may qualify for warranty replacement. The Sticky Holster that I’ve been using for over a month now seems to perform its intended function nearly flawlessly. While the absence of belt clips or loops allow the holster to be positioned or repositioned wherever the user pleases or quickly donned or taken off, it may sacrifice some level of stay-put-ness and might not be ideal for users who regularly engage in vigorous physical activity. However, after nearly two months of regular wear throughout daily activities, I didn’t experience any issues with holster slippage. I did notice two minor issues with the holster that I want to point out and suggest that potential users be conscious of the firearm they plan on carrying in the holster. The first issue is that the first test pistol I used with the holster would encounter a small snag on the rear sight when drawing. The three layers of the holster are surrounded by a textile seam sewn around the edges. 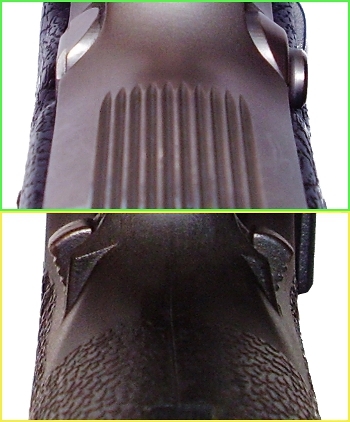 When drawing the firearm up and forward, the sharp edge of the rear sight blade would slightly catch on that seam. The exposed edge of the seam is probably less than 1/32″ wide and the catching is easily overcome during the draw, but it was noticeable. The second pistol I tested the holster with, as is the case with many pistols intended for carrying, did not have such sharp edges or protrusions and did not catch at all when drawing. 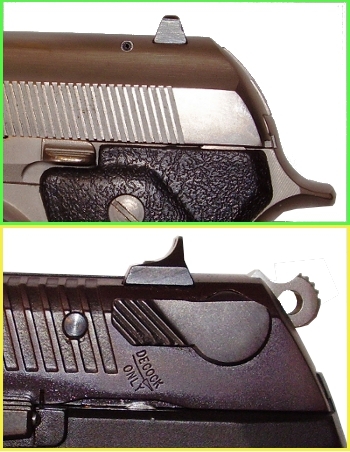 The second issue was, again, a difference between pistol designs with different levels of carry-friendliness. On the first test pistol, the magazine release is operated by pressing the thumb-button, which extends from the grip at a sharp angle, forward. In a situation where the pistol is in a holster held in place by pressure between the waistband and body with the magazine release at or below that pressure, drawing the pistol may cause the magazine release to be inadvertently manipulated. This happened twice within a month on the first pistol. Again, the second pistol, with a more carry-friendly less protrusive magazine release that is pushed straight in, this was not an issue. At a price point around $25, Made in USA (in Naples, FL) quality construction and a solid warranty, the Sticky Holster is a convenient, flexible carry option provided that you’re not engaging in vigorous sports or packing a carry-unfriendly pistol. You can buy them online or find them in many retail stores that sell CCW accessories. If you have one of these holsters, tell us about your experience in the comments below or in the Gear Review section of the GunLink Forums. Thanks for the great review. The price and the fact that it is Made in USA are good selling points. Pingback: Gunz Inc. Sells Sticky Holsters! | Gunz Inc.